The last stop on our Alaskan cruise before returning to port in San Francisco was Victoria, British Columbia. Unlike our other stops in Alaska, Victoria offers no obvious trails into the wilderness from the docks. It is a big city, and even a hike to the city highpoint of Mt. Douglas would take most of the available time we had ashore and then some, all for a modest summit in a city park on the other side of town. Besides, it was my wife's birthday today and we couldn't just run off and leave her without marital consequences. So, the five of us walked together into town to pay a visit to Victoria's Chinatown where we stopped at a bakery for some coffee. The town appears to have quite a bit of money invested - well-kept buildings old and new, construction cranes and other signs of continual building and rebuilding. 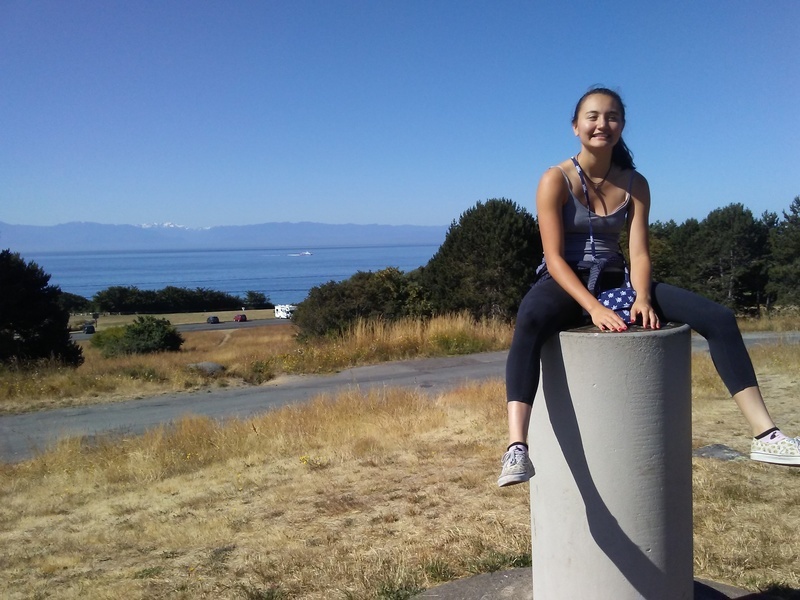 The wives decided to go off to "look around" meaning "unsupervised shopping", leaving the three of us to pay a visit to Beacon Hill, a diminuitive summit overlooking the Strait of Juan de Fuca on the south side of town. It is the highpoint of the city's Beacon Hill Park, about 150 acres of parklands with forests, fountains, ducks, turtles and the ever-present menace of large herons nesting in the trees overhead. These are said to be capable of dropping MOAB-sized excrement on passerbys and those looking up to gaze at the noisy birds in their large nests. Surviving this, we found our way to the grassy summit where a large flagpole flying the Canadian flag is found. Park benches allow one to look across the stait to Washington State and the Olympic penninsula, with snowy Mt. Olympus as the centerpiece of Hurricane Ridge and the other high mountains of Olympic National Park. After some time taking in the views here, we dropped south towards the shore and joined the throngs of folks walking the pedestrian path found there. Back towards the harbor, we paid a visit to the breakwater, walking its length, another popular walking route. After this we returned to our ship, concluding a pretty easy day ashore. Time for lunch!